Before I get started reviewing Party Poker for you, I want to point out the importance of getting an accurate and informed review of poker sites that you are considering playing at. I’ve been in the business of reviewing poker rooms for many years now, and I’m also very familiar with the way these reviews are normally written up by other people. It might surprise you to know that most of these poker reviews aren’t even written by people who have even played poker online ever, let alone at the level that’s required to provide you the accurate and informed picture that you are looking for and deserve. The reason for this is that the person who owns a particular website may or may not be a poker player himself or herself, but even if he or she is, he or she is probably not that talented of a writer, and the language of the site may not even be the one that they speak. So what people do is hire professional writers to do the reviews for them, and these guys write for a living so some are pretty good at it. However, they get their info from just reading other people’s reviews, and those people probably haven’t even ever played on the poker site either, so it becomes pretty much the blind leading the blind. I’ve played poker online for a living for several years and have been playing at Party Poker even longer, and even more importantly perhaps, I’m not from the U.S. so I’ve been able to still play there after they stopped taking Americans a few years ago. I’ve played at the high limits, the low limits, and everything in between. In fact I’ve played the smaller stakes just so I can get a better idea of what’s going on there for the benefit of my students, as I’m also a poker coach and teacher. So this certainly won’t be the shortest review you’ve ever read of a poker room, as I’ve included all the things you really need to know in order to truly make an informed decision on whether you want to open an account at Party Poker or not. You’re here and reading this because you want all the info, and that you shall get. So let’s start by talking about Party Poker itself, the company, and then we’ll move on to what is in store for you there. Party Poker has been one of the world’s most favorite online poker sites since the early days of online poker. In fact they were the world’s largest poker site up until the decision was made a few years back to no longer accept players from the U.S. The truth of that matter was that the standards for Party Poker are set much higher than other large online poker rooms such as PokerStars and Full Tilt Poker. Party Poker’s parent company, Party Gaming PLC, is a publicly traded company on the London Stock Exchange, so the stock exchange requires all of their dealings to be completely above board, and doesn’t permit them to do business in any grey areas. So not only did they comply with U.S. law, they even paid a large fine to the U.S. government, for which they were in no sense obligated to do by the way. The fine was for offering gaming to U.S. players before the law was passed. It seems pretty crazy that they would pay it, but they were more than willing to. That’s how far that Party Poker is willing to go to comply with the rules, and as poker players, this is very comforting to know indeed, especially in a business where few things are certain, as people found out recently with seeing PokerStars, Full Tilt Poker, Ultimate Bet, and Absolute Poker have their sites shut down by the U.S. government. Full Tilt and PokerStars made a deal and are back in business, for now at least, but Ultimate Bet and Absolute have now declared bankruptcy, and no one knows whether or not they will get their money back. So once again, one of the great things about playing at Party Poker is that you know your money is safe, and they are complying with all laws, even laws in different countries than they are located. Not only does this protect you against the poker site being attacked by some pretty powerful forces such as the U.S. government, it assures the complete safety of your money on deposit with them, and also ensures that you’ll always be treated fairly by them. Given the choice, I’d want to deal with a completely ethical company every time, especially with my money on the line. Party Poker is that company and are clearly second to none in this regard. In addition to players being able to play poker at Party Poker, or other poker sites on the Party Poker Network, for those players who enjoy other forms of online gambling, Party certainly has you covered there. Their selection of other forms of betting in fact is second to none. They offer a wide selection of casino games, in addition to real money bingo and backgammon. If you like sports betting, they have that available as well. On top of all this, you can also place bets on the financial markets, without actually buying or selling any instruments. The selection at Party Gaming in terms of all the different things you can bet on is second to none in fact. You get all this selection in addition to having all of your gambling money with the most trusted name in the business. In addition, the folks at Party Gaming have been doing this for a long time and really know what they are doing, and have won several awards in fact over the years. Without a doubt, the most important thing in deciding where the best places to play online poker at is the softness of the competition at a given poker site. I can’t tell you how many students I’ve turned from losing to winning players just by getting them to switch from a tough site to win money at to an easier one. Even if you’re a winning player at one of the tough sites, where the players are generally of a better caliber and thus harder to make money off of, it stands to reason that if you instead play at an easier poker site, you will make more money. At the end of the day, the way we keep score in poker is in terms of money won or lost, so you would think that this would be pretty important indeed. I have always been surprised though at the lack of attention a lot of players pay to this, especially the more casual ones, who often just sign up at a poker site and don’t even shop around to see what else might be out there. They end up lamenting on how much money they lose, or the fact that the games have gotten so much tougher lately and it’s so hard to beat them now. I will tell you that overall, the games have indeed gotten tougher, as with all the poker instruction on the internet that’s out there now, there are a lot less really bad players around. This is much more the case at the tougher poker sites though, and in particular, the mega poker rooms like PokerStars and Full Tilt, which are rife with a lot of online professionals. These online pros generally don’t even play the high stakes, and usually play a ton of mid stakes tables. So if you’re a casual player, you’re often sitting at a table with some very good players even at the stakes you play. This isn’t an ideal situation to say the least. Back in earlier times, it wasn’t uncommon to see a whole table full of bad players who would play most hands and play them too far. Back then all you really needed to do in order to win money was to play tighter than the other players, and when you’d become involved in a hand, you’d generally be playing better cards than they would be, and would win their money over time that way. However, things have changed since then, and there are more tight aggressive players around, and while these players can be beat, you generally will win less money against them than against the loose fish. So it has become even more important to seek out softer competition. Relatively speaking, the competition is certainly looser at Party Poker than places like PokerStars and Full Tilt. This has always been the case in fact, and still is today. Ever since Party Poker stopped allowing Americans to play there a few years ago, I can’t tell you how many times I’ve heard Americans lament about how much easier it was to make money back in the “Party days,” and wish they could play at Party once again. If you’re not from the U.S., then the party continues. Party Poker certainly isn’t the only poker site with soft competition, and there are several others out there where the players are relatively easy to beat in general as well. It’s not enough to have the players be fishy at a poker site though, as you also have to look at how many fish in total are there. It does you no good to know that there are some real good games at the stakes you play, but there’s very few or even no tables running at it when you want to play. People like to play at different hours of the day as well, so it’s also important that there’s lots of action both day and night, which will require a busier poker site. So what it all comes down to is having more tables to choose from at a given stake, and the more tables that are running, the more selective you can be. Table selection is in fact an important element to playing winning poker, but that doesn’t do you much good if there are very few tables running at the game and stake you like to play. Now I’m not saying that some of these smaller poker sites aren’t worth having accounts at, and in fact, you want to have an account at any room that has fishy tables running. The trick is to be able to play at the most profitable games running at any given time on the internet, and once you can manage it, having accounts at smaller poker sites as well is a very good idea in fact. However, you will need to have a main poker account, and regardless of whether you think Party should be your main one, it really makes no sense not to have a poker account there. 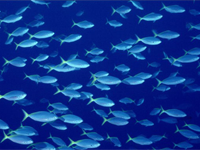 Among all the other things Party Poker has going for it, the fish to good player ratio is excellent, and the total amount of fish is as well. So this is an ideal situation, and given that you always want to be at the softest tables, there will be more at Party Poker than anywhere else. Party Poker has finally updated its software to a more modern version. Gone are the tired old same old avatars that had remained unchanged for years. To be honest, although I did get real sick of looking at them, my annoyance with this was more than offset by the fishiness of the players and all the money I was making off of them, so I really didn’t mind too much. However, things look much more modern these days, and the changes are much more than just skin deep in fact. Their filtering system is very good, and that’s very important since you want to be able to find the best games there quickly, as this often means more or less money in your pocket at the end of the day. The usability of the software has always been pretty good and you won’t find any real issues with that, and they have made a lot of improvements in that regard as well. In particular, the half pot, three quarters pot, and full pot buttons are very helpful, and not every poker site has them. They’ve also taken some of the best ideas from other poker sites and incorporated them in their software, which has really brought things up to date. I’ve been pretty critical of their software over the years, but I’m now glad to say that they have really gotten things right, and have also shown that they are really out to make the experiences of their players the best they can make it. I’ve already spoken about the higher standard of ethics that Party Poker subscribes to, and this carries over into their commitment to providing the fairest poker games possible. There is a lot of concern in general about players cheating for instance, and Party Poker has state of the art computer programs specifically designed to root out and punish these players. Some people think that live poker is safer in this regard, but this isn’t true at all, and live poker has been known to be rife with cheating and collusion. You’d never get away with this at Party Poker though, as their programs evaluate every hand and know exactly what to look for to catch these people. A lot of players also worry that the shuffle isn’t as random as it should be at certain poker sites. Now this is mostly due to confusion and paranoia, but at the same time there are differences between poker sites in this regard, to the extent that one poker site might have a more random shuffle than another. While all poker sites these days are plenty random enough, and all are much more random than a real deck of cards would be, unless you shuffled for a few years between deals, at the same time it’s nice to know that Party Poker uses a state of the art program which is among the best in the business. This is completely not an issue there in fact. If you’ve read the Party Poker bonus section on our site, then you know that Party Poker offers a 100% match of up to 500 dollars, Euros, or Pounds. I’ve taken the time to work things out for you to decide which one would be best and making your initial deposit in British Pounds won out. I want to point out that Party’s initial deposit bonus is excellent compared to other poker sites, especially the fact that they pay it out in 1/10 increments, meaning that you not only get your bonus money faster, you are more assured of getting it all. The way Party Poker calculates their Party Points is also beneficial to their players, and this also allows bonuses to be freed up faster than at many other poker sites. They also offer reload bonuses from time to time as well, where it’s pretty much the same deal as when you first deposited, and whether or not you need to deposit again, these are always worth taking advantage of. Party Poker also offers a nice reward program where you earn Party Points with every raked hand you get dealt cards in, and for every tournament you pay a fee in, and you then redeem the points you earn for merchandise and other goodies. As well, the more you play, the more you get, and they have 10 different levels that you can achieve based upon how much you play, with more Player Points given out at each subsequent level. They also have a “tell a friend” promotion where for every friend you refer, you get $10 in cash for every 60 Party Points your friend earns, and they also offer the same deal to your friend. So both you and your friend can collect up to $100 in cash just for getting your friend to try out Party Poker. Once again, we’re not talking bonus money here that you have to play a lot of hands to free up, as in this case your friends are freeing it up for both of you. When you think of how many friends you have, this could easily add up to a lot of money for you, and you’d be helping them all out with extra cash as well. This is something a lot of players don’t really take advantage of, but there’s no reason not to, and this just adds to the desirability of this poker site. As you might expect from a poker site this size, there’s plenty of game selection and action at any time of the day or night across many variations of poker. So no matter what you like to play or what stake you like to play at, you should have no trouble at all finding a good amount of tables to choose from. This is especially important once you work your way up to the higher stakes, where things can really thin out at less popular poker rooms, but with the sheer amount of players at Party, you’ll find a lot more action at the top as well. If you enjoy poker tournaments as I do, then you’re really going to like what Party Poker has in store for you. While the cash games are known to be nice and soft at Party, this is particularly true with Party Poker tournaments. Regardless of the format which you prefer, whether it’s sit and go, medium sized tournaments, or the real big ones, and regardless of what buy-in level you prefer, there’s always lots of action going on day and night at Party Poker. If you enjoy freerolls, Party Poker gives away over $100,000 in freeroll money every month, so this is like freeroll heaven. This is a great way for newer players to gain valuable experience by the way without even having to risk any of their own money. Party Poker also runs a lot of special tournaments, offering seats to special events such as the World Poker Tour and the World Series of Poker. In fact, Party Poker now owns the World Poker Tour, so if you ever imagined winning a seat to one of their events, Party Poker is the place to do it at. As you can see, there’s a lot of good reasons to have an account at and play at Party Poker. This is a first class poker site all the way. When you take everything into account, which I’ve laid out for you in this review, I’m sure that you can see that there’s absolutely no good reason why you shouldn’t try out this great poker site if you don’t have an account there already. In fact, there’s no reason to wait to get started, and even if you don’t have any money to deposit right now, you should still open an account and lock in your bonus using our bonus codes. 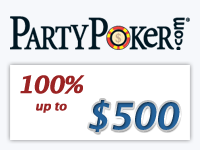 So all you have to do now is click on your link and enter in the Party Poker bonus code and you’re on your way. You only get one shot at a bonus offer at a poker room. So it’s obviously important that you get it right, especially with the potential of hundreds of dollars, euros, or pounds on the line. Now with most poker site bonuses, it’s a fairly simple matter, and some even just have one single bonus code that you need to put in. Of course if you don’t have it you will miss out, so it’s still obviously important to visit the various sections of our site to get the specific instructions you’ll need, as well as our advice and recommendations on which to choose should there be several options, which there often is. With the Party Poker bonus code 2018 (all our codes are listed at the bottom of this page) though, there are indeed several options, so you’ll need to pay close attention to our advice to make sure you get the most out of the Party Poker offer. We’ve done all the calculations for you though and made it all incredibly easy, as you will see. The first option is to enter no Party Poker bonus code at all, which isn’t the best choice by the way to say the least, as you will only be entitled to an extra 100 of whatever currency you choose. You will be eligible to earn five times this by entering in one of our bonus codes, which is obviously something you want to do. So there are four options available, with one choice for each of four different currencies that you can deposit in, which are U.S. Dollars, Canadian Dollars, Euros, or British Pounds. With our Party Poker bonus codes that we have for you, you can choose to have Party Poker double your money in whatever currency you choose, up to 500 of the currency of your choice. So the first thing we need to do is to look at the relative value of the currencies, although that alone may or may not be enough to decide what is best, but rest assured that we’ve done all the math for you and will be letting you know what the best choice is based upon the amount you have to deposit and how much you expect to play. So right now, here’s how the currencies stack up: 1 USD = 0.96 CAD, 0.70 EUR = 0.61 GBP, where USD is United States Dollars, CAD is Canadian Dollars, EUR is Euros, and GBP is British Pounds. Now unless you have more than 500 of the lowest valued currency, which is USD right now, you might not think that it really doesn’t matter which currency you choose, although if you have more than 500 USD it would, since you can then get a bigger Party Poker bonus by using one of the other currencies. However, this isn’t the only thing you need to be thinking about, as I’m about to explain. Now here’s where the math comes in. Party Poker releases your bonus at different rates depending on the currency you choose to play with, and they don’t necessarily match the different relative values of the money. So to take a look at this, let’s assume that you have only 100 USD to deposit, or you could instead deposit the equivalent amounts of 96 CAD, 70 EUR or 61 GBP, and you’re looking to decide which one would be best. Now for USD and CAD, your bonus is freed up by collecting 6 times the amount of your deposit in Party Points. With EUR, the number is 8 times the amount of your deposit in Party Points, and with GBP it is nine times your initial deposit. So How Does This All Stack Up With Party Points Needed Accounted For? So your bonus money will be equivalent using these different currencies, and it will be exactly 100 USD in fact. So if you deposit 100 USD, you will need 800 Party Points to collect the bonus. If you use CAD, you will only need 768 Party Points. If you deposit in EUR, you will only need 560 Party Points to get an equivalent amount in bonus. Finally, if you deposit in GBP, you only need 549 Party Points to free up the same amount of bonus money. So the obvious choice is to go with GBP, and it also has the added advantage of having a higher maximum for those of you who are able to make higher deposits. As the maximum bonus that Party Poker pays out is 500 of a given currency, then if you can put in 500 GBP, then you’re obviously getting the most bonus for your money, as for instance if you deposited 500 USD, you’d only get 305 GBP worth of bonus money. So GBP wins out on both counts as far as choice of currency to make your initial deposit goes, as it will both allow smaller deposits to be freed up quicker, and allow a higher bonus amount to larger depositors. To get our GBP bonus you will have to use our special Party Poker bonus code for 2018 “PBC500GBP”. How Are Party Points Calculated? In any real money cash game that you are dealt cards in, 2 Party Points are given for every $1 that you contribute to the rake. Now with many poker sites, they calculate the actual amount that you contribute to the rake directly, which makes things tougher on better players to free up their bonuses. This is not the case at Party Poker though, as they use the total of the rake for the hand and then divide that by how many players were dealt cards in it, which is by far the better way to count things. So the donkeys at your table end up earning you extra Party Points by contributing too much money to pots, in addition to just plain giving their money to you by playing badly. If you like to play tournaments, you get 2 Party Points for every $1 you contribute in tournament fees. Some poker sites don’t even count tournament fees towards freeing up your bonus money, but Party Poker takes care of all its players every step of the way, and don’t discriminate against you simply because you prefer to play a different form of poker. How Is Your Party Poker Bonus Paid Out? Unlike some poker sites which make you wait until you free up the whole thing before they pay you the bonus, or do it when you hit half of it or a quarter of it, Party Poker’s bonus increment deal is by far the best in the business. They pay it out in increments of tenths, meaning that if your total bonus is 100, you get to collect it every time you hit 1/10 of it, meaning that you get it in 10 payments of 10 each. This is very important for a couple of reasons. First of all, the quicker you have the bonus money in your hand the better; and second, even though they give you 60 days to free it all up, you may not play that much and miss out on big chunks if not for this generous method of payment. In addition to the generous Party Poker bonuses that we’ve arranged for you to get by simply going through our special link and then entering in the Party Poker bonus code, they also offer frequent reload bonuses, where they offer similar deals to existing players that they are about to offer you as a new player there. They will let you know what they bonus codes are as they roll out these special deals. In addition to this, once you’ve earned enough Party Points to free up your initial deposit bonus, you can then trade in all the Party Points you earn after that for cool items in their store. The more you play, and the bigger you play, the higher level you rise to, and there are 10 levels altogether, with more and more Party Points earned with each move up the ladder to a higher level. Party Poker recently increased their rewards in fact and they are even more eager now to have you play there, and are putting their money where their mouths are. The initial deposit bonus is just a start to the rewards they have for you, and all the these generous rewards are just a start as far as all the great reasons to play there is concerned. Here’s the list of bonus codes, and remember, use the one for GBP to free up your bonus the quickest and be eligible for the highest payouts as well. It doesn’t make any difference whether you live in the U.K. or not by the way, as they will automatically convert whatever currency you use to GBP. Don’t forget to make sure you go through our link to Party Poker, which means you should do it right now and at least sign up, and also arrange for your starting bonus, even if you don’t have the money to deposit at the moment. This will keep you from having to come back to our site whenever you’re ready to actually deposit money with them, although the sooner you do that, the sooner you can start earning your rewards, in addition to taking advantage of all the loose action that has made Party Poker so famous. 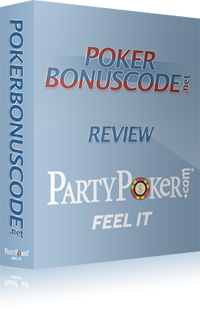 Without a Party Poker bonus code 100% $100 Not recommended! Tournaments have become a very popular form of online poker. Many players find them more entertaining than cash games, and it’s not that hard to see why. Tournaments are more involving for one thing. With cash games, you spend most of your time not involved in the action, and although astute players will still pay attention, most players don’t bother since they find this too boring. However with tournaments, everything that happens at the table affects you, and some of the most exciting moments may not even involve you. For instance, two players may be going head to head and if they get all in and one player busts, you can move up the money list. Given that it matters how your chip count compares to other players, every movement by anyone affects your standing. This also affects what strategies you will use. Do you play it safe in one situation and let other players make the mistakes? Do you need to be more bold in another because if you don’t you’ll be in trouble? There’s so much added strategy to tournaments and so much variation that they are not only a lot more interesting but a lot more fun as well. In addition, as time passes, you get to watch yourself climb up or go down the leader board and see your relative standing. You also watch people bust out and see that with each player leaving your chances to win money increase. Once you do make it into the money, things get even more exciting, as you root for more people to go out and at the same time for your stack to grow so you can make even more. Once again, do you play it safe or go for the gusto? You get all your chips in once again, and your tournament life is once again on the line, will you survive this time? Sometimes you won’t, but there’s always another tournament right around the corner so you can start this very entertaining process once more and see if you can do better this time. Perhaps the best thing about tournaments is that, due to their structure, what you can lose is pre-determined, and never is more than your buy-in. So you’re much more in control of things and don’t have to worry about being hurt. If you’ve ever gone through a real bad luck streak at cash poker, I don’t have to tell you how painful this can be, and sometimes this can even be bad enough to clean you out and undo months of progress at the table in a very short period of time. So when you stop and think of it, poker tournaments offer both more pleasure and less pain. Is it any wonder then why they are so popular? For more serious players, tournaments also offer the potential for lower variance, and this is especially true with the single table formats. Variance is the potential for feast and famine, where you have to keep a certain amount of buy-ins in reserve to protect yourself from busting out. With cash games, due to the streaky nature of things, where you can have both long winning streaks and long losing ones, you need to have a lot of buy-ins on hand. With sit and go’s in particular, these losing streaks will be significantly shorter. This means that you can play higher stakes relative to your bankroll and enjoy a higher relative earn rate per hour. So the bottom line is that with tournaments you can make more money with less risk, which is a significant advantage. Tournaments are a party of sorts, and the party never ends at Party Poker. The selection of tournaments there are very good, and even more importantly, the competition at their tournaments is famously soft. This is very important, as how well you do is determined both by your skill level and the skill level of your opponents. Players spend a lot of time and effort working on improving their game, but tend to neglect the other side of the coin, which is seeking out games where the players tend to be bad, making it a lot easier to do well. I can tell you that without a doubt, the tournaments at Party Poker are definitely easier to do well in than at a lot of poker sites. They are full of chumps who don’t play very well, and if you’re any good at all, you won’t have much trouble with them. If you’re not that good yet, well do you want to get smacked around by better players all the time, or would you rather play somewhere where it’s easier to win at? No matter what your skill level, easier is always better, and a lot better in fact. Whatever your preference, you’ll find lots of choice at Party Poker’s tournaments. First of all, you get to choose your poker game of choice. You can choose between all 3 types of hold’em (limit, pot limit, and no limit), 2 types of 7 Card Stud (regular or hi-lo), and 3 different variations of Omaha (pot limit, hi-lo, and pot limit hi-lo). Then you get to choose the tournament type, with 1 table, multi-table, steps, qualifiers, and hellkat all being offered. Within the 1 table format, you can also further refine this according to the amount of seats offered, from a full table to heads up. You then select the speed, choosing between standard, speed, and turbo. Finally, you select your buy-in, with the selections being $1, $3, $6, $11, $22, $33, $55, $109, $210, $310, $510, $1010, $2010, and $5010. So the choices here are enormous and regardless of what you like to play and how much you want to spend, you’ll be able to find exactly what you want. And, unlike lesser poker sites, the traffic at Party Poker is excellent, so there’s a ton of tournaments running at any time of the day or night. You need both the ability to choose what you want, and the poker site to be busy enough so that you don’t have to wait very long to get in on it, and Party Poker does a great job of providing both to you. They also offer a great filtering system where you tell the software exactly what you want and it instantly finds the available tournaments for you. Once you’ve decided what you want to play, you can then enjoy the convenience of using their quick seat function to be seated at the next available seat at the tournament type of your choice, so you don’t even have to pay attention. This is as user friendly as it gets in fact, and the setup here makes navigating the thousands of tournaments that they run a ridiculously easy process for you. For starters, Party Poker shows their appreciation to its players by offering a whopping $100,000 worth of freerolls every month. 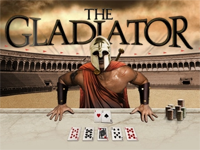 They also have the Gladiator Challenge where based upon your play you can be rewarded with a free seat at tournaments with prize money up to $25,000. There’s also several ways to earn a seat at the World Series of Poker main event, a prize package valued at $14,000. You can even earn a seat at the WSOP just from your play alone if you play enough. They are even running a million dollar tournament which you can win a seat at for as little as $1. Imagine yourself sitting down at home and playing for your share of this huge prize. In addition to all this, Party Poker runs a weekly $250,000 guaranteed tournament every Sunday, with an excellent selection of qualifying tournaments for those who’d rather play it on the cheap, including just using some of the Party Points that you’ve earned just from playing there to enter. They also offer qualifiers in both sit and go and multi table formats, so if you’re a better sit and go player, you can win your seat at it that way. All you do is choose the amount that you want to spend here, anywhere from just spending some points, to $3, to just buying into the tournament directly for $215, and you’re on your way to the excitement. Party Poker also owns the World Poker Tour, so if you ever imagined yourself on TV playing for the big money that the WPT is famous for, Party Poker is your connection. You probably don’t have the huge amount of money that you normally have to plunk down to play in one of these events, but with the help of Party Poker, that isn’t necessary. They offer all sorts of ways that you can earn a seat at these big tournaments, and as always, these opportunities are set up to allow everyone a shot, regardless of how much or how little you have to spend. There’s nothing that can match the excitement of a poker tournament, even the smallest ones. Of course, the bigger the tournament, the higher the excitement level, right up to Party Poker’s Summer Million. When you add up all of the great reasons to play at Party Poker, and especially if you enjoy poker tournaments, if you don’t currently have an account at Party Poker, there’s absolutely no reason to put this decision off any longer. We’ve also arranged for you to get some very generous bonus money from Party Poker just for trying out their outstanding poker site. 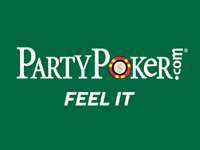 So all you have to do is click on our banner, and register for an account at Party Poker. Don’t forget to enter in our special Party Poker bonus code to get the bonus we’ve arranged for you. It doesn’t make sense to have to come back to our site to get it, so there’s no reason not to register now, even if you don’t have the money to put in there yet. Once you’re there though, I know you won’t be able to wait to get in on the exciting real money action there though, and Party Poker will be making the whole process very easy for you. See you at the tables! Poker Bonus Code is an independent resource, meaning I have chosen to write about Party Poker because it's a site where I personally play. Or you can browse the official PartyPoker.com website and discover it on your own.